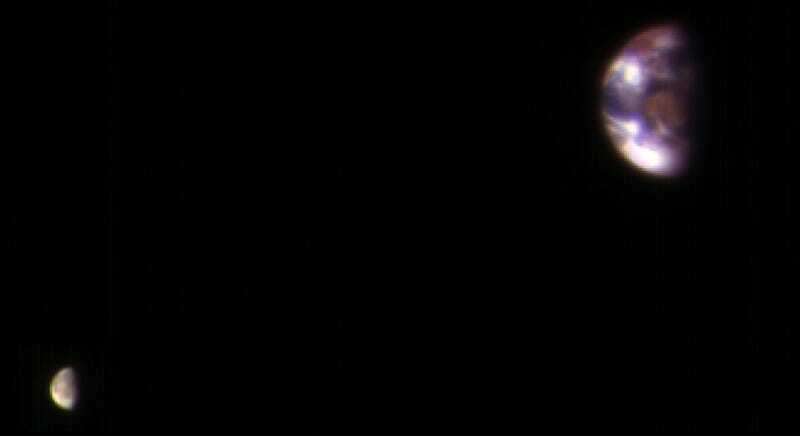 During a recent calibration exercise, NASA’s Mars Reconnaissance Orbiter captured a remarkable view of Earth and its moon from a distance of 127 million miles (205 million kilometers). It’s so clear, you can even make out our planet’s continents. To calibrate the HiRISE camera aboard the Mars Orbiter, NASA scientists needed to scan an object other than the Red Planet. Seeing as Earth is right next door, that was an obvious choice. The image is a combination of two separate exposures taken on November 20, 2016, and have been moderately adjusted to make both objects appear equally as bright (otherwise the Earth would have appeared too dark). The combined view shows the correct positions and sizes of the two celestial bodies relative to each other. That said, the Earth and Moon appear closer than they actually are in this image because the observations were made when the Moon was almost directly behind the Earth (from the perspective of Mars). The distance between the Earth and Moon is in reality about 30 times the diameter of Earth, or about 230,000 miles (370,000 km). 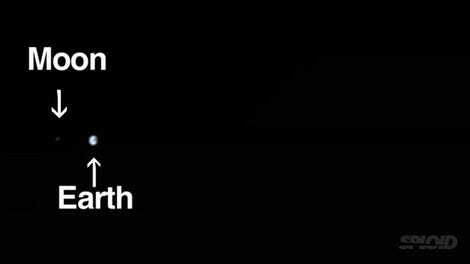 The image below shows the distance of the Earth and Moon to scale. Looking at Earth in the new HiRISE image, the oceans and continents are clearly visible. The reddish object near the center of Earth is Australia, and the clumps at the top left corner are bits of Southeast Asia. The bright spot at the bottom is Antarctica, while other bright areas are clouds. As an aside, our Moon is the fifth largest moon in the Solar System, but it’s the largest moon relative to its host planet’s size—excluding Pluto and Charon, because as we all know Pluto isn’t really a planet (sorry, Pluto! ).